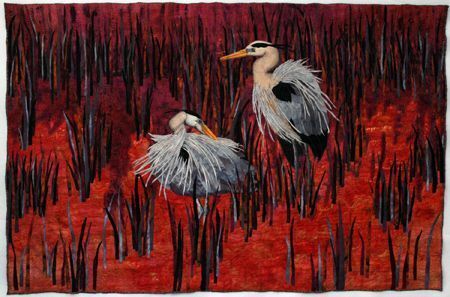 There is no end to the list of talented fiber and quilt artists. It is unlikely I’ll ever run out of artists that I’d like to interview.So, I’ve chosen one of my personal favorites; Tracy McCabe Stewart. Her work is impressive. She stands out in a field with so many outstanding artists, that’s not an easy thing to do. Her unique approach to art is natural, and it’s organic . Her use of color knocks my socks off. There is an hint of an Asian flavor to many of her pieces. These are things that make her work easy to identify. I like her work very much and I know that you do too, for her to have achieved the measure of success that she has. When you check out her web site and blog you’ll see an impressive list of awards and kudos. But mostly, you’re going to fall in love with her work, if you haven’t already done so. 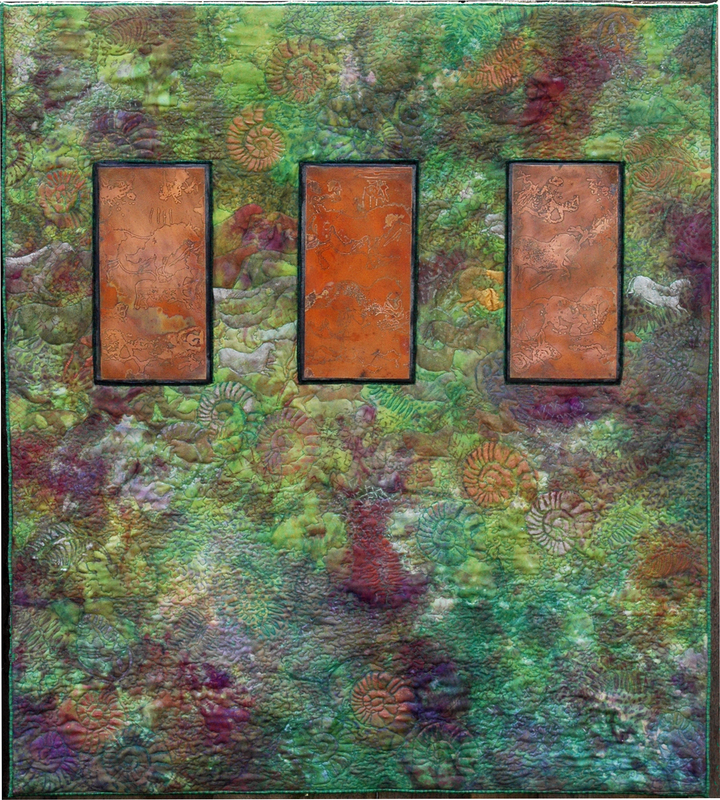 My work centers on the patterns, colors and textures of the natural world. I am drawn to the decomposition and evolution of objects: spring growth, the erosion of land by waterways, corroded metal, the destruction of wood by insects, fungal growths; the record left from the interaction of objects, elements, creatures, and cultures through their cycles of destruction and rebirth. I capture these images in photographs and use the pictures in the initial stage of design or use them as direct material in my pieces. I use my own surface designed fabrics in my work. The spontaneous nature of surface design often leads my creative process. I work intuitively: drawing ideas from the material at hand and expanding from there. I include natural objects in my work: stones, bark, fossils, metals, as well as ancient maps and writings; documenting their travel through time. 1- What – inspires you to create and how do you keep motivated? I really go though phases with my creative inspiration. I am always inspired to make something, but it might be dyeing fabric one month, quilting another, gardening, or taking photographs in another month. I guess the consistent part of that is that I am constantly inspired by the natural world and the life cycle within it. I am also very interested in the interaction between human made things and their erosion within the natural world; rust, peeling paint, etc. I love that crusty aesthetic. As for motivation, I have learned to give myself room for all of these interests, rather than feeling that the only work that “counts” is fiber art work. 2-Where do you get your ideas? I am always fascinated by the idea of translation: translating a natural form like a piece of bark into a fiber piece, translating a form from one artistic discipline to another, combining all of them. I am usually sparked by something that I’ve seen outside; a shape or a texture. It simmers for a while and then I get some harebrained idea about how I want to express that inspiration. I’m off and running from there. I have had some grand failures with this method and some art pieces I thought turned out pretty well. I hate to sound like such a broken record, but being out nature is my biggest influence. It’s my main leisure activity, my spiritual connection and the inspiration for almost all areas of my life. I also love to travel and am quite inspired by architecture and history of the places I’ve been lucky enough to visit. 4-What do you do for fun [besides quilting]? I am currently learning to sail. I took a trip with my husband around some of the Scottish Isles a few years ago and have never forgotten how different an experience it was to approach them from the sea, rather than land. I would love to do a whole lot more of that in my future. I am really into travel. I love to explore the art, architecture, history and food of places. My husband is Scottish and my daughter has been living in Asia and is about to return for another year there. They have both given me great places to visit and explore. I love animals. I am the adult shoving the little kids out of the way at the petting zoo and pulling over to pet the horse in the field. It can make me rather embarassing to to be with:-) I also have two dogs and spend a fair amount of time in their company. We had been having printer problems with both our printers. My husband had fixed them and I had plugged my laptop in to print a document. The printer didn’t work. At this point, I was beyond any problem solving and started brushing up on my cursing skills. My husband later showed me I had plugged into a loose USB cable, attached to nothing. Thankfully, he waited enough time to show me to make it funny. I am lucky enough to not be relying on art to put food on the table. I do try to post somewhat regularly on my blog, maintain a website and do shows. I am less involved with galleries than I once was. I am in a transition right now with marketing and sales. I’m not quite sure where I’m going to be putting my energy in the future. I am exploring what works for my art and what the best way of marketing my art may be. 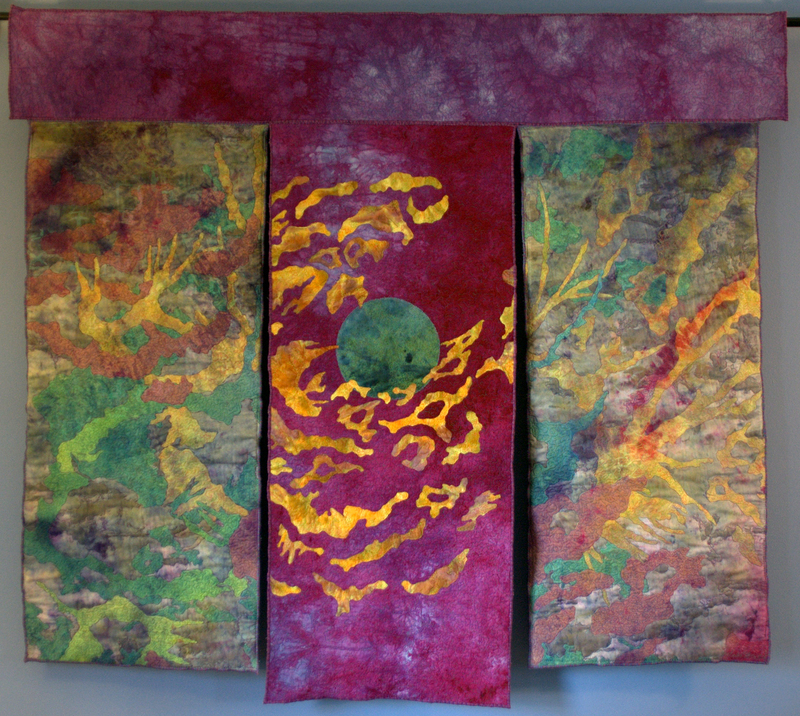 7- What advise would you give an aspiring fiber artist just starting out? I would advise you to try to find your own voice. Take classes that are about learning a process, rather than completing a project in the style of the teacher. Take classes in other media. I began my arts career in music. I then moved on to metal working and then ceramics before starting to work in fiber Each of those disciplines gave me a fresh eye for looking at things and another perspective for solving design and construction problems in a piece. I first learned to trust my ideas in other media I’ve worked in. Fiber art has a whole traditional history which can make it less comfortable to go in your own unique direction. I don’t mean that there is nothing to be learned from making pieces from historical patterns, but it’s a different journey. 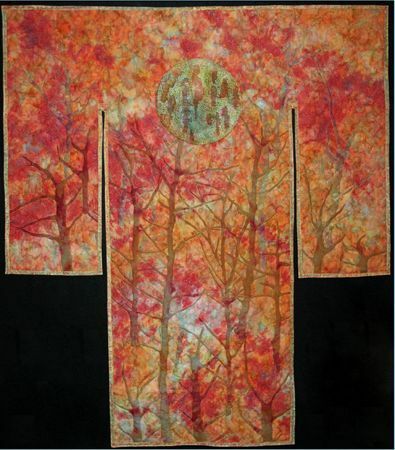 In all art there is a nod to what came before, but I think in traditional quilting can be more restrictive than that. For me, it would be much harder to try to find my artistic voice. I had an advantage coming into fiber from other media, rather than trying to transition from traditional quilting into art quilting. 8-How would you describe your style? 9-Describe yourself in 5 words. Goofy, sincere, pragmatic, curious, passionate. 10-What have been your biggest obstacles in achieving your success? I think the biggest obstacle has been my attention span! Seriously, I think that my interests are diverse and that means I don’t always spend the time I need to on any particular aspect of my craft. To be a master at something one need to be a bit obsessed; have that laser focus. My interests are spread pretty far and wide. Categories: famous quilters, Interviews 2, Interviews-2, Older Posts-, Uncategorized.